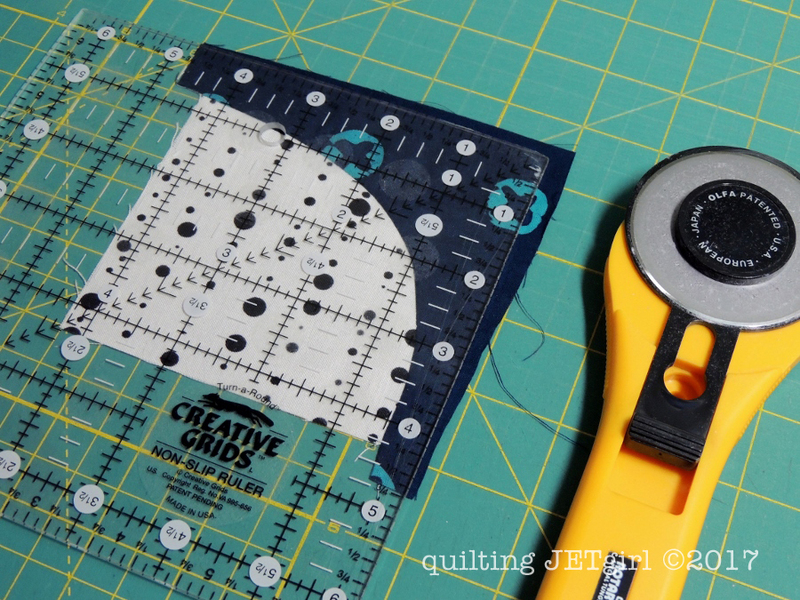 I am demonstrating this using the same size blocks (5-inch charm squares) that I used to create the mini quilt. 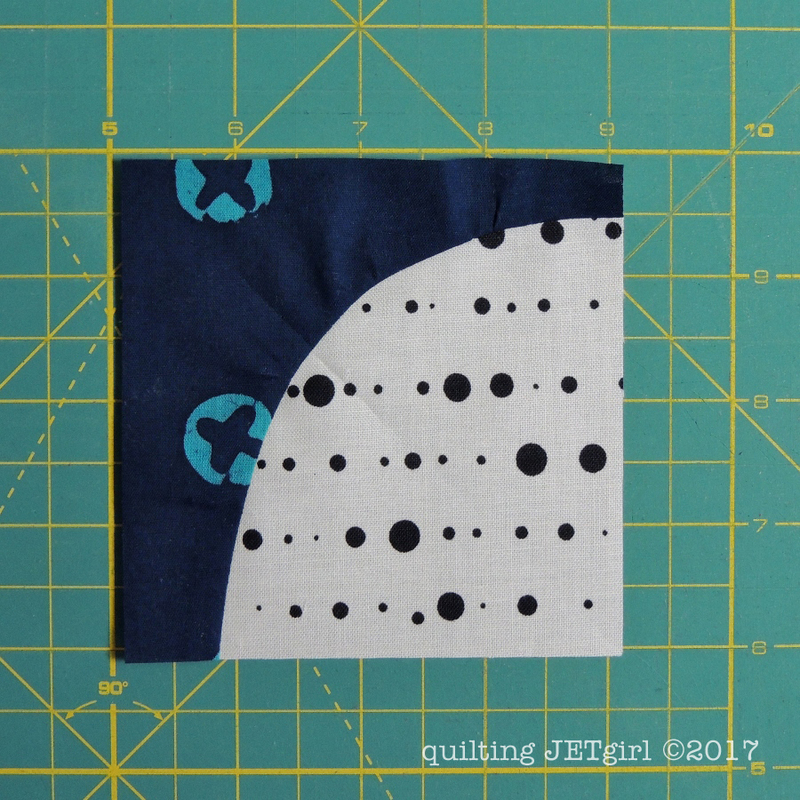 If you are new to sewing curves, I recommend starting with larger blocks / curves as they are more gentle and easier to sew. For instance, try this using 2 layer cake (10-inch square blocks) if you have never sewn a curve before. 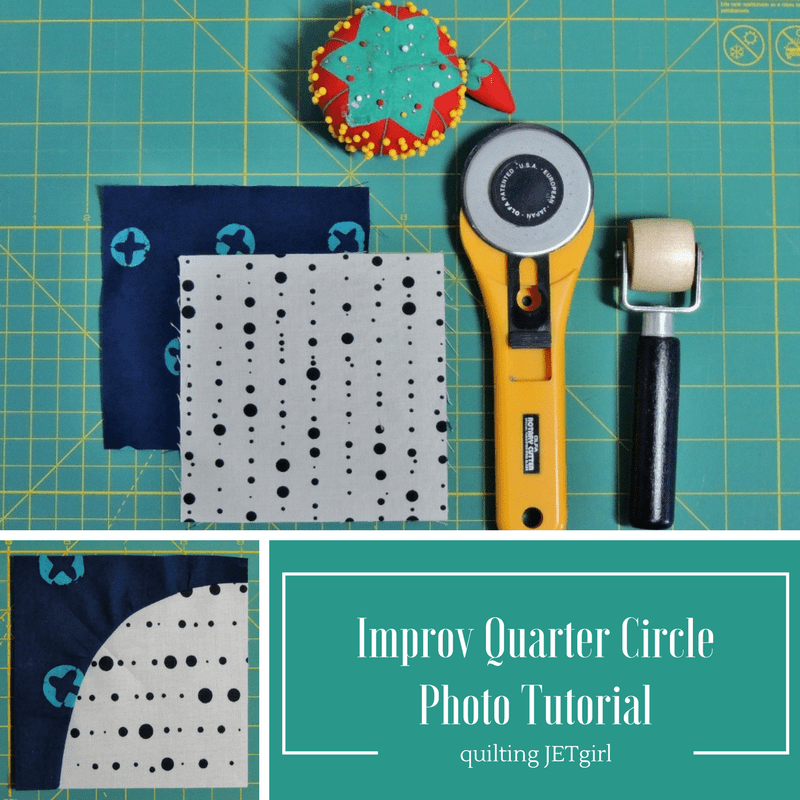 This method uses two squares of fabric and creates two improv quarter circle blocks that are inverse images of one another. In other words, one block has Fabric 1 as the quarter circle and Fabric 2 as the arch and the second block has Fabric 2 as the quarter circle and Fabric 1 as the arch. The tutorial format is photograph followed by descriptive text. Place your two fabrics on top of one another with both fabrics having the right sides facing up. Using your rotary cutter, make a free hand cut of an arc. 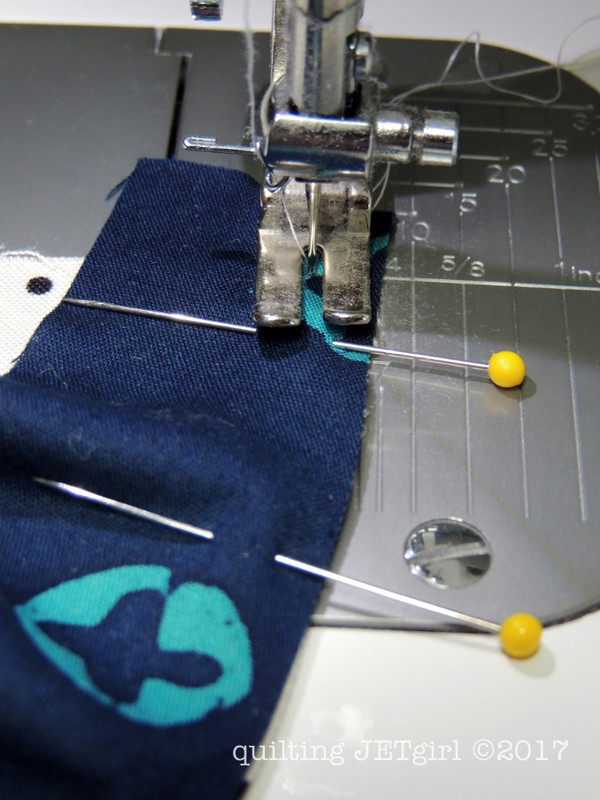 Trace an arc using a fabric safe marking device and then use your rotary cutter to cut along the line you marked. 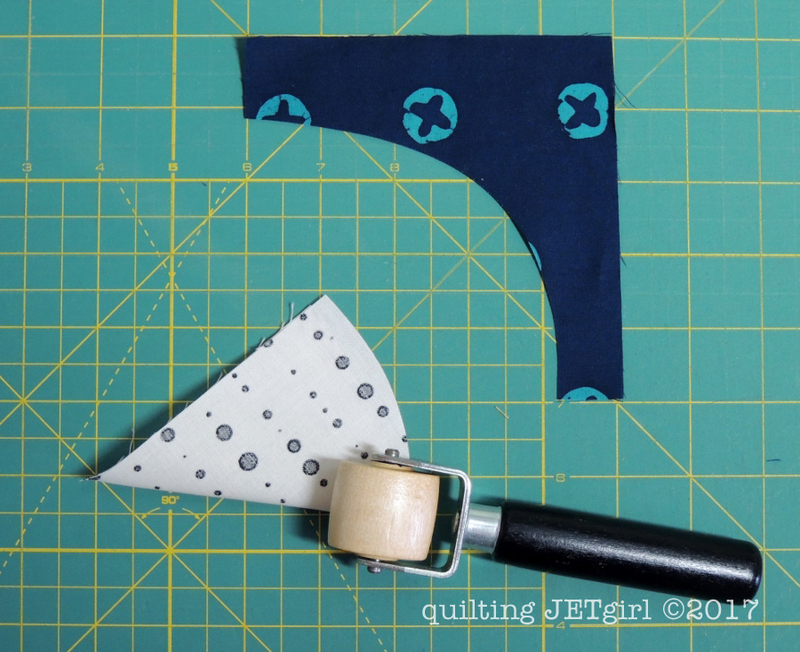 Pin the two fabric squares together around the edges and use scissors to cut an arc. 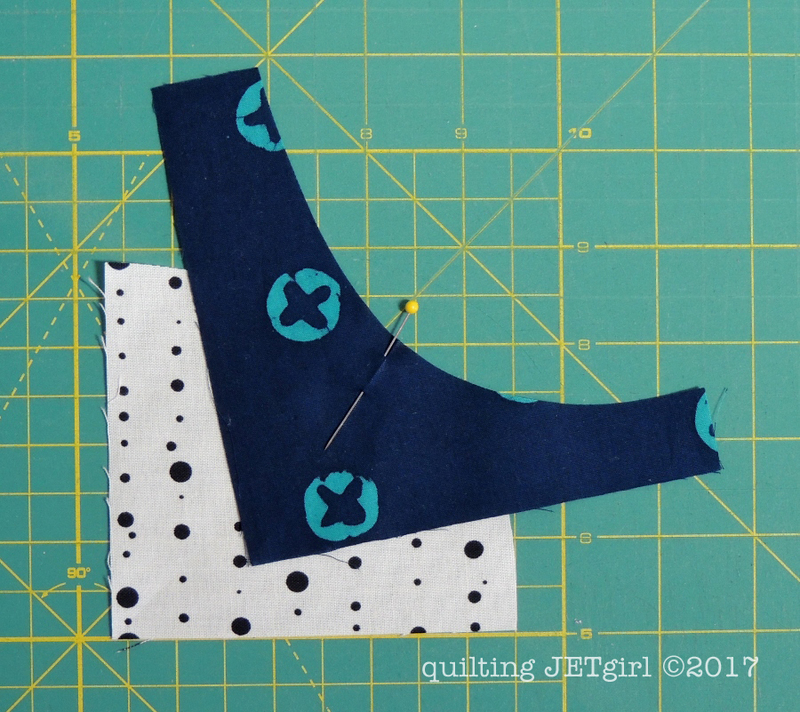 Combine the two methods above and cut your traced arc using scissors after securing the two pieces of fabric together using pins (to keep the fabric from shifting and roughly aligned). 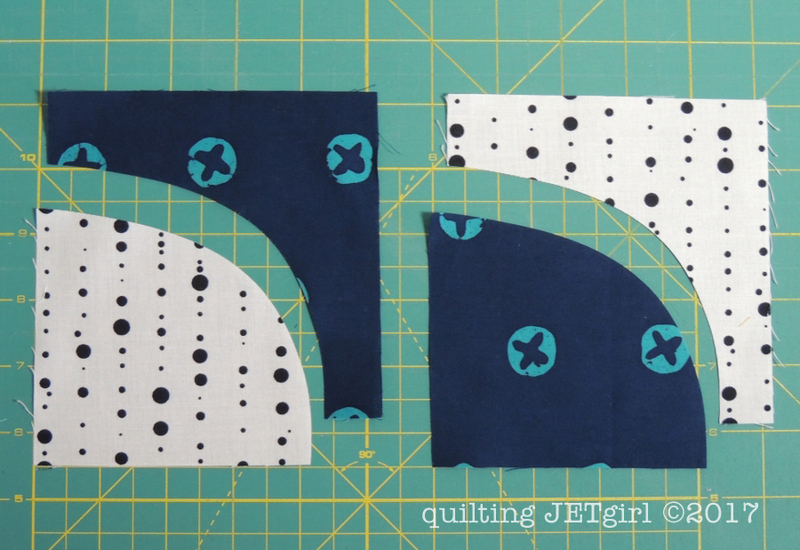 Create your two pairs of blocks by alternating the fabrics for the quarter circle and arch. Select which block to work with first. 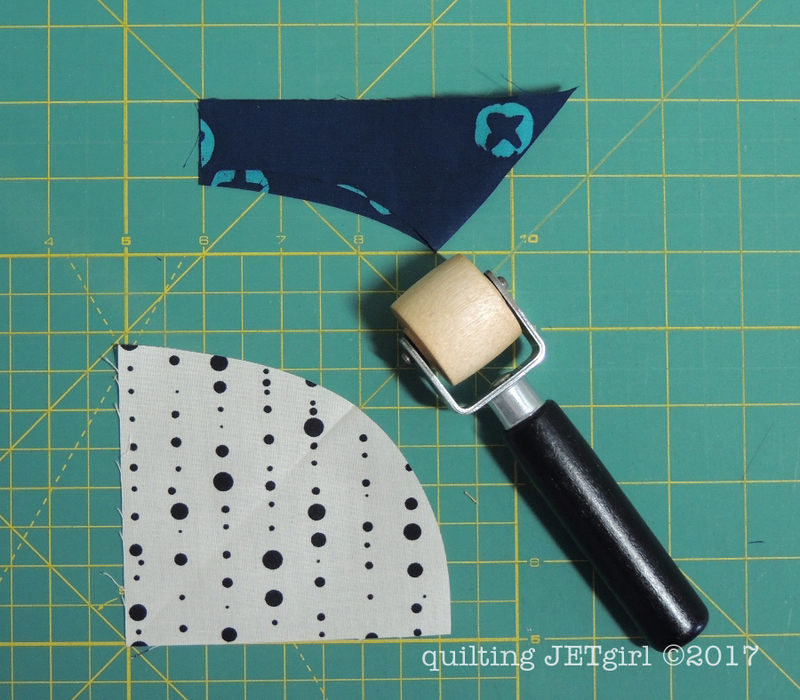 Fold the quarter circle in half, aligning the straight cut edges and press a crease in the “center” of the arc using a wooden seam roller, your finger, a chop stick, or a tool of your choice. Note that I started with 5-inch squares of fabric, so a single reference is sufficient. If you are working with larger starting sizes, it is likely beneficial to then fold each straight edge over to meet your center crease to create (2) additional quarter arc creases. Fold the arch fabric in half, aligning the square corners and press a crease in the “center” of the arch using a wooden seam roller, your finger, a chop stick, or a tool of your choice. Placing right sides together, align the edges of the quarter circle arc and the arch at the creased center marks and pin the fabric together. If you created additional creases, pin them together in a similar fashion at this time. 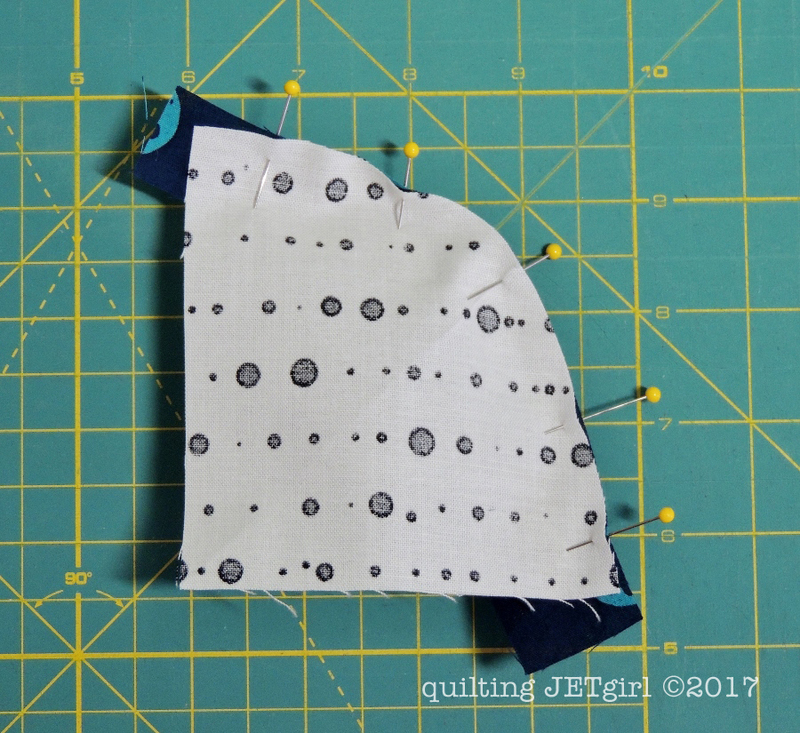 Working from the center out, gently curve the arch fabric around the quarter circle and pin the fabric together halfway to the edge of the quarter circle and at the edge of the quarter circle. 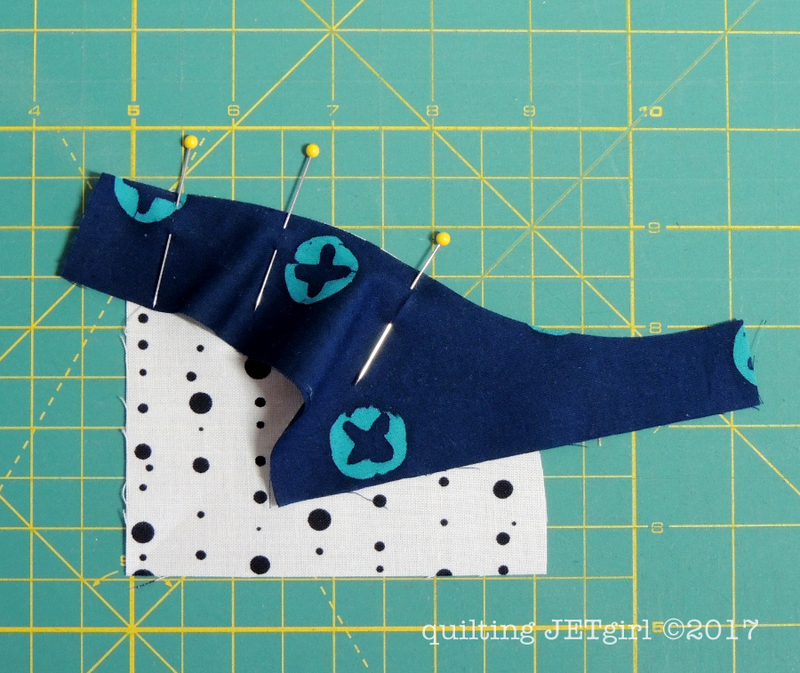 Adjust the number of pins and placement as necessary for the size block you are working with. Repeat pinning process on the other side or continue until the two pieces are fully pinned together. 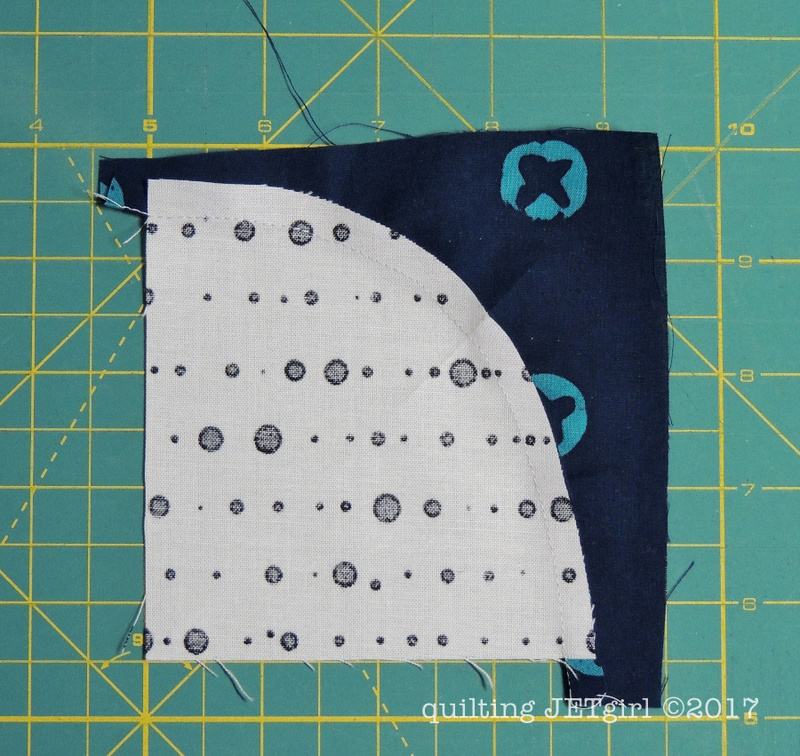 I am showing the back side of the pinning process to emphasize that the arch fabric will extend beyond the edge of the quarter circle. This is the way it is supposed to be; do not try to force the edges to meet. Because we started with the same sizes of fabric when we made the initial cut, the arch will be larger than the cut quarter circle when piecing. 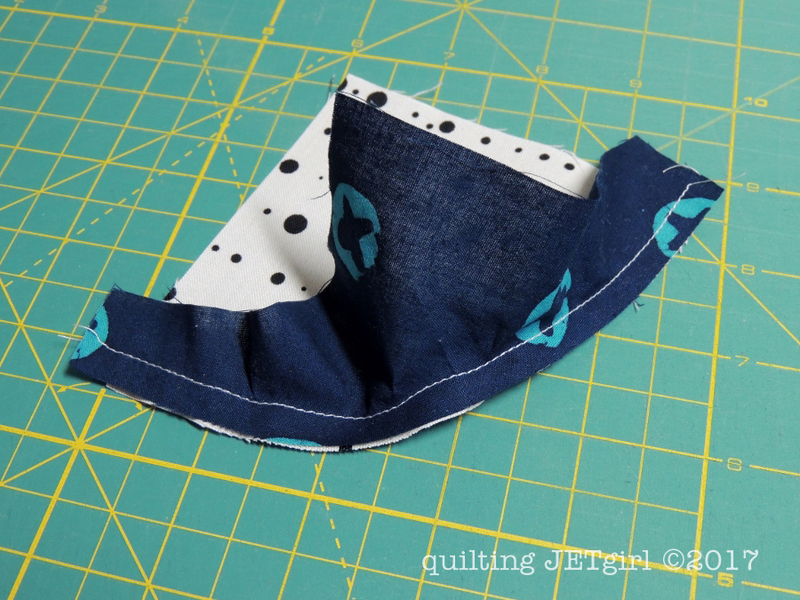 With the arch fabric on top, begin sewing the pieces together using a 1/4-inch seam allowance. 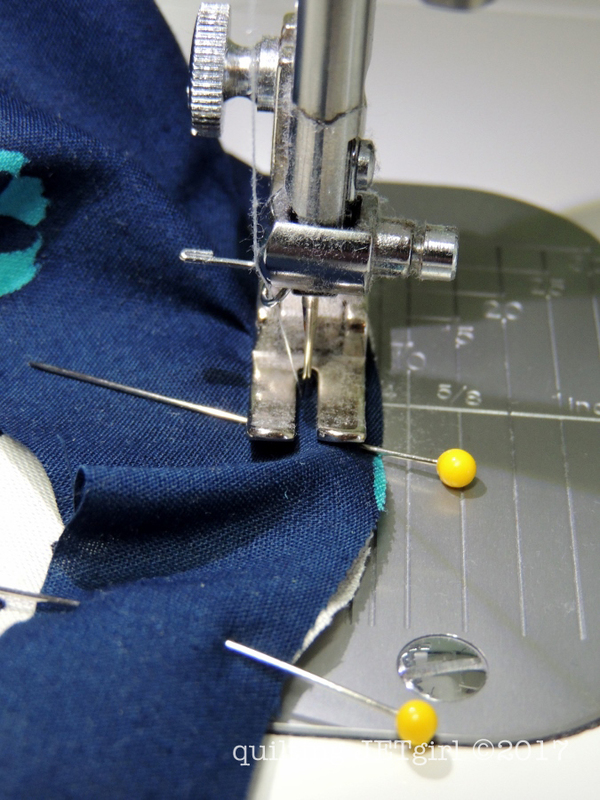 I like to remove the pins when my presser foot is in this relationship to the first pin and then I use the pin like a stiletto to help encourage the arch fabric to stay in the correct position over the quarter circle fabric until I come to the next pin. I tend to sew 2 to 3 stitches and then adjust. When I adjust, I make sure the sewing machine needle is down, and then I lift the presser foot and gently rotate the block to maintain the 1/4-inch seam allowance. Continue on in this fashion around the entire perimeter of the quarter circle arc. Note that you can see there is a “fold” in the arch fabric just in front of the presser foot in this photograph. As I approach these natural waves in the fabric, I stop with the sewing machine needle down and lift the presser foot so that I can then lift the left hand side edge of the arch fabric up and encourage the fold to move away from me and under the presser foot. This allows the fabric in front of the presser foot to lay flat again and helps decrease the number of tucks I sew. Again, this is a stronger challenge for smaller curves. If you start with larger curved piecing this will be less of a challenge or issue. This is what the unit will look like when you are done sewing them together. I like to use my wooden seam roller to then gentle press the arch fabric down, effectively pressing the seam toward the arch / away from the quarter circle. Press. This is the view of the back of the pieced block after it has been pressed. Note that the center creases are aligned and that the arch fabric extends beyond the quarter circle. 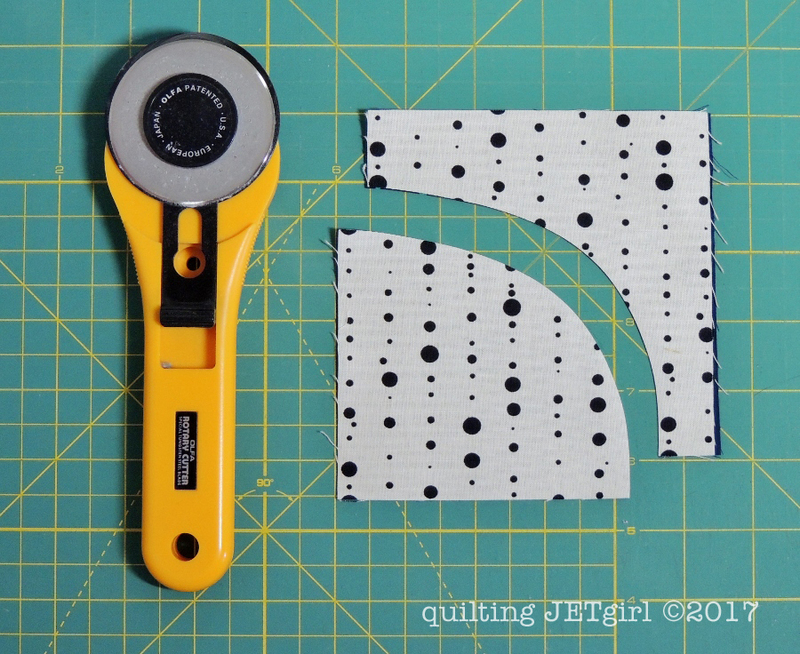 Because these are improv cut circles, you may find that you cannot trim to have 1/4-inch of the arch material at the edge of the block: you will likely have more or less than that amount. That is the fun of improv and I like to embrace each block being trimmed slightly differently. Admire your work and enjoy! This is great Yvonne! I need to invest in one of those wooden seam rollers, lol. Thanks for illustrating the process so well. This is a great tutorial! Thanks, Yvonne! Wonderfully written! I love improv drunkards path blocks! Thanks for sharing your method, yet another project for my list! 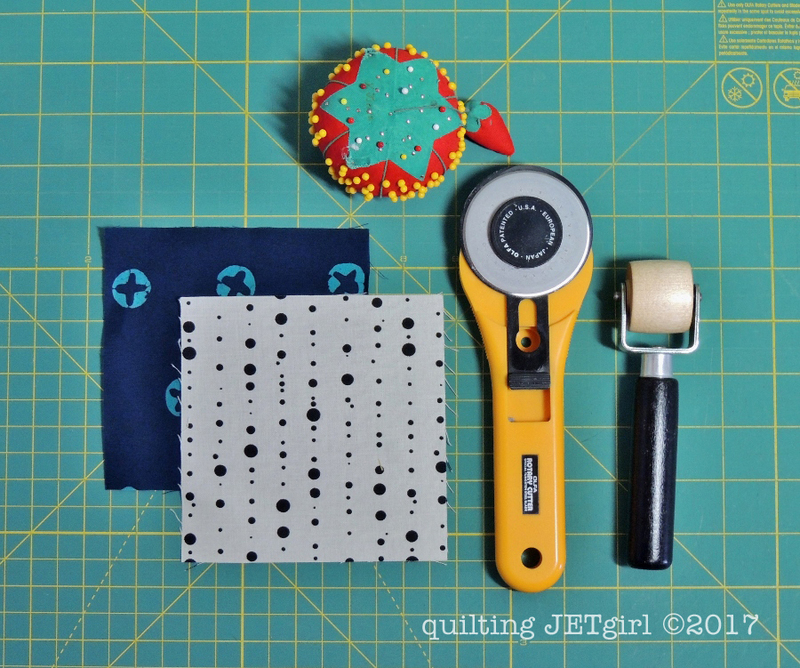 I love your mini quilt and am so glad you posted this tutorial. It seems so easy, but I’m sure it is not. I’ll mark this one for some time in the future. Nice tutorial – thanks for sharing! Yvonne, I like this process. I always use my fingernails to finger press but this is a much better method. Yvonne, you have a real talent for instructions and I would love to see more! Your Mini is just perfect. Thanks for the tutorial! This is a great tutorial, Yvonne. Your instructions are clear and concise. I’m saving it for later. Thanks! great tutorial, I’ve only done curve piecing once and it was so hard, I think your method might be easier than what I did. I will have to give it another try. I don’t know why but I find the free hand ones easier to sew in that the ones from templates. I love the resulting quilt you made! In looking at your Comes in Waves I didn’t realize that those blocks were improv pieced. Very well done! I admit that I still tend to shy away from curved piecing but this is very doable and who can resist using that wooden seam roller! Great tutorial Yvonne. You manage to make it all look so manageable. Thank you for this great tutorial! I’ve bookmarked it for when I have a chance to try, sewing curved seams has long been on my to do list to learn. Love your tutorial Yvonne! Your finished quilt is lovely and I will have to give this a try. That’s for sharing. Good tip about the arc extending past the main piece — I would have tried to line up the edges. I might give this a try. We learned curved piecing from Violet Craft at Glamp Stitchalot last year. Great tutorial and pictures! I like the tip about lining up the middle of the top and bottom fabric pieces. I’ve only done very gentle improv curves. I like these curvier ones and I may try them out later. I’m so itching for a piecing project right now! This totally reminded me of the Meadow quilt curves, maybe I should work on that next. Have you tried the no-pin method for curves? (there’s a 2 minute youtube video) I’ve tried both methods and really like the no-pins method!